This article on the history of the BCS first appeared in Clavichord International, Vol. 13 No. 2 (November 2009). We are grateful to the editor for permission to reprint it here. In the years since it appeared, there have been a number of fresh developments: additions have been made to the original text to take account of these, with the extra text in square brackets. In 2014 the Society will celebrate its twentieth anniversary. The clavichord revival began in Britain with the completion in 1894 by Arnold Dolmetsch of the first clavichord to be made in modern times. The British Clavichord Society was formed almost exactly one hundred years later, in 1994. It is perhaps surprising that it took so long to arrive: societies devoted to particular instruments (the Lute Society, the Viola da Gamba Society and so forth) had existed for some time, and with the clavichord, an instrument usually cultivated in private at home rather than in public concert halls, a means of putting isolated enthusiasts in touch with each other to share information and compare experiences would seem even more necessary. As things turned out, the spark that was to lead to the formation of the BCS was a clavichord recital by Derek Adlam in February 1994. It was one of a series of concerts organised by Paul Simmonds and Marianne Mezger in the atmospheric medieval guildhall in Lewes, Sussex, that also served as the workshop of Karin Richter and Malcolm Rose. Despite the wintry evening, there was a capacity audience: most were local, but some had travelled quite long distances, because clavichord recitals were rare. Paul invited some of them to return to the workshop the following morning to discuss the formation of a clavichord society for Great Britain. We had before us the pioneering example of the Dutch Clavichord Society, which had already been established for six years; we knew that a clavichord society had been founded in Germany in the previous year; and of course there had been the inspiring outburst of clavichord energy at the first International Clavichord Symposium at Magnano in September 1993. All agreed that the time for a British society had come. It was quickly decided that it would be a members’ society, open to all, run by a committee drawn from and elected by the members. How to achieve this from a standing start was the problem. 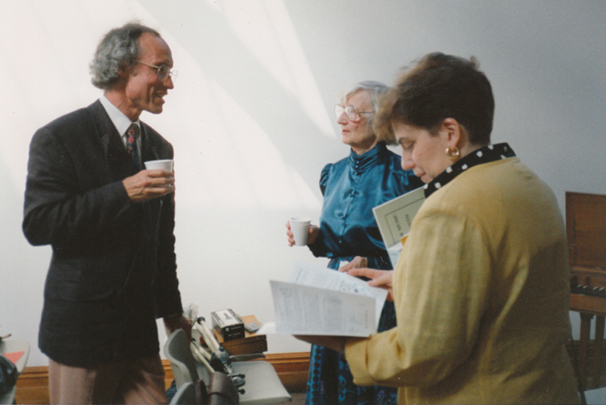 We decided to organise a public meeting, which duly took place on 19 June 1994, with the Bate Collection, Oxford, kindly acting as hosts. Invitations were sent out to everyone we could think of, and Paul Simmonds and Derek Adlam volunteered to bring instruments and play. In the event, sixty people from all parts of the country attended. A number of decisions were taken: membership of the new society was to be open to all whether resident in the UK or not, the voice of the clavichord would be heard at every meeting, there would be special reduced rates for students and young people. Pending elections, volunteers were invited to join an interim committee. Paul Simmonds was chosen as secretary; Sheila Barnes took on the role of treasurer and membership secretary. A name was chosen, and the British Clavichord Society came into being. It remains an unincorporated society without any legal identity – a form of organisation which is quite common in Great Britain, and which seems to have served us well so far. Having chaired the meeting, I found I had become the society’s first chairman. Within a year, the society had enrolled its first members and issued its first Newsletter, and the interim committee had drawn up a Constitution for the members to approve. And one further important decision had been taken: Derek Adlam had been invited to act as president and had accepted, a role which he has undertaken ever since with distinction and aplomb. In those early days, there were differing views about what the aims of the new society should be. In the twentieth century, the revival clavichord had deviated considerably from the original seventeenth- and eighteenth-century models. This was partly because the characteristics of the old instruments were not well understood, but mainly because makers pursued their own musical ideals, prizing above all a sweet, sustained sound and a yielding touch. Now, in the 1980s and 90s, there was a strong reaction in some quarters against this kind of instrument in favour of a more historically accurate type. Yet the English revival clavichord had its own tradition: it had been played by many distinguished musicians, and had even inspired the creation of new music. There were those who wanted the new society to be essentially a campaigning voice against the revival clavichord and in favour of the new, historically oriented type. I am particularly glad that we did not go down that route, but instead went out of our way to offer a home to adherents of both traditions. As a result, we have had as members some prominent figures of the clavichord revival, including Dr Carl Dolmetsch, Ruth Dyson and John Morley, as well as proponents of the historical clavichord such as John Barnes. In fact, the differences between the two types of clavichord were not generally well understood, even by that section of the musical public that took an interest in the earlier repertoire. Allowing both sides to have their say, and analysing and discussing the differences, has been illuminating. From the outset the new society plunged into a wide range of activities. Of first importance is our programme of meetings and events open to the public. We have had to face the difficulty that our instrument is not suited to large spaces, so audiences have to be quite small, and if we charge for admission, the income generated will not often cover costs, particularly since we decided early on that professional players who perform for us should be adequately rewarded (and tuners too). We have nearly always had to pay for the hire of rooms, and it has been hard to find suitably sized, quiet venues at reasonable cost. Nonetheless, there have been some outstanding successes. I think particularly of the five clavichord weekends organised every other year in late August at St Cecilia’s Hall in Edinburgh, coinciding with the famous Festival: these were spread over three days and included recitals, talks, master-classes, and visits to the collection of instruments in the Hall and also to those at the home of John and Sheila Barnes. John and Sheila organised the first weekend together; after John’s death in March 1998, Sheila continued with preparations for the meeting later that year, and took a leading role in subsequent weekends. The Edinburgh meetings gave British clavichord enthusiasts the opportunity to hear fine clavichord players from other countries, often for the first time: among these were Marcia Hadjimarkos, Menno van Delft, Steve Barrell, Miklós Spányi, Siebe Henstra and Pierre Goy. We have also held study days (or half-days), generally in the years when there was no Edinburgh weekend. These focus on a particular topic, with lectures as well as performances on the clavichord and other keyboard instruments. 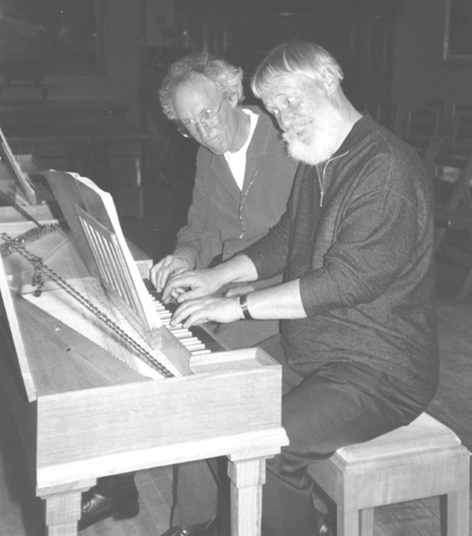 Thus in April 1997 we spent a day at Cambridge considering Haydn’s keyboard music, with clavichord performances by Bernard Brauchli and Derek Adlam, and Susan Alexander-Max on fortepiano, and talks by Richard Maunder, Kenneth Mobbs and Derek Adlam. 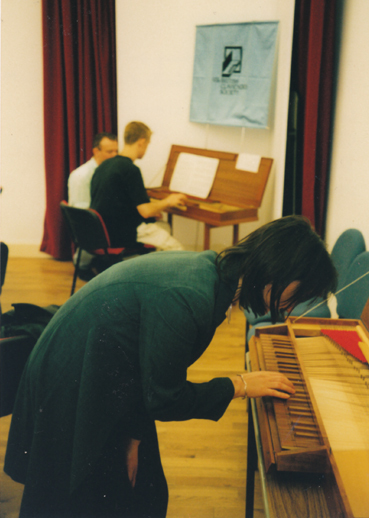 Another memorable study day was the 2003 London meeting on Iberian Music before 1700, which included performances by Bernard Brauchli and Ilton Wjuniski, and was the occasion of Ilton’s meeting with the lutenist Jacob Heringman, which has since led to a number of performances by them as clavichord-lute duo. Above all, there was the 2006 study afternoon on Handel’s Keyboard Music, held in St Lawrence Whitchurch, a church that Handel would have known well while he was living at nearby Canons in the service of the Duke of Chandos (1717-18). The clavichord was played on this occasion by Paul Simmonds and Terence Charlston, and the day concluded with an organ recital by Julian Perkins. The composer Stephen Dodgson was so inspired by this event that he decided to revise his two Suites for Clavichord, originally composed in 1967 (Suite 1) and 1971 (Suite 2) for a Goff instrument, in the light of the kind of clavichords now available. The revised suites have now been published by Cadenza Music, and recorded by Julian Perkins with financial support from the BCS. Among the many individual recitals, the three that [the late] Gustav Leonhardt gave us stand out, particularly his inspired playing of little-known works by such composers as Schildt, Krebs and Ritter at Dulwich in 2004; also Colin Tilney’s moving account of W. F. Bach’s eight Polonaises at Lewes in July 1996, Menno van Delft’s revelatory lecture-recital introducing the composer Johann Gottfried Müthel, and Carole Cerasi’s recent superb Haydn performance at Oxford. A special occasion was our tenth anniversary meeting at Lewes in 2004, when the first BCS Awards were presented: these are intended to mark outstanding individual contributions to furthering the cause of the clavichord. 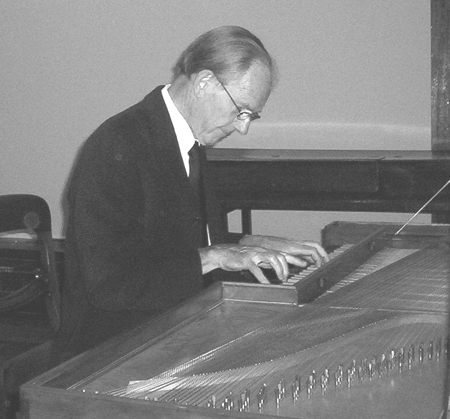 The first recipients were Bernard Brauchli and [the late] Virginia Pleasants, the former for his pioneering activity in collecting, performing and recording on clavichords, for creating (with Christopher Hogwood) the Magnano Clavichord Symposia, and for his indispensable book on the instrument, published in 1998. Virginia was honoured for her long advocacy of the instrument, performing and teaching on it, and promoting clavichord works by twentieth-century composers such as Haward Clarke and Stephen Dodgson. Later recipients of BCS Awards were Rodger and Lynne Mirrey, in recognition both of their generous gift of the Rodger Mirrey Collection of instruments (including three important clavichords) to Edinburgh University, and of their enthusiastic support of the society from its earliest days. Alongside the public programme, we have for many years run events for young keyboard players at specialist music schools, conservatoires and university music departments. This is our ‘Education Initiative’, the entire cost of which is met from BCS funds; it has been organised in large part by Richard Ireland, with help from Garry Broughton, Judith Wardman and Micaela Schmitz (among others). The idea is to provide several clavichords of different kinds for participants to try for themselves, under the guidance of tutors who lead the day and give short public recitals to show the students (and their teachers) what a good clavichord can be when played by a skilled clavichordist. Tutors have included Paul Simmonds, Steven Devine, John Cranmer, Terence Charlston and Micaela Schmitz. 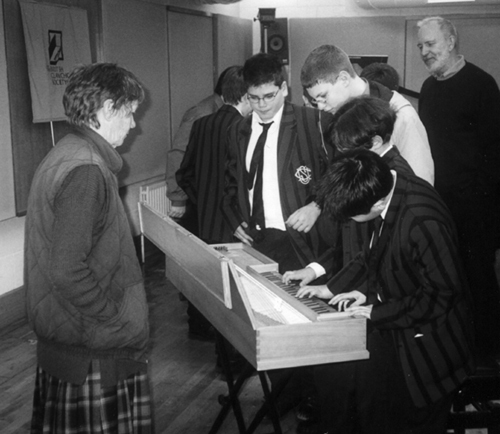 In addition, the education initiative has sponsored master-classes by John Henry and Menno van Delft, and has provided financial assistance to promising young keyboard musicians from the UK and elsewhere to enable them to receive clavichord tuition, both at Paul Simmonds’ regular courses at West Dean in Sussex and also privately. We hope to continue and even expand this and other sponsorship activities. In summer 2004 we took a particularly bold step. To mark our tenth anniversary, a competition was announced for new compositions for the clavichord, with cash prizes. Administration was undertaken by Sheila Barnes and Paula Woods. The competition was widely publicised, and attracted 48 entries from twelve countries, from well-established professional composers as well as amateurs and a few students. Judging was performed ‘blind’ by a panel consisting of Paul Simmonds, John Cranmer and the distinguished composer Anthony Payne. First prize went to Gary Carpenter for Van Assendelft’s Vermeer, a piece which was later recorded with financial support from the BCS; four other prizes were awarded. The winning items were performed at two recitals, in Edinburgh in August 2004 and in London in March 2007. Even some of the non-winning items have now been performed several times in various countries. Many BCS members are unable to come regularly to events, so for them a major benefit of belonging to the society is the Newsletter, published three times a year from February 1995. It has had only two editors, Paul Simmonds up to June 2001 and myself since. We have tried to make it as varied and interesting as possible, without directly competing with Clavichord International, which many BCS members also read. We have been extremely fortunate in having a large number of impressively well-informed and articulate members prepared to write for the Newsletter, so that a variety of voices is heard. Contents include articles of general interest alongside announcements, reports of events (our own and those organised by others), reviews of books, CDs and scores, and members’ advertisements. Occasionally original research is published, for example Francis Knights’ two articles (in 2006 and 2008) about evidence of clavichord use in sixteenth- and seventeenth-century England. There is a long-running series of articles by various authors listing and describing clavichords in public collections in Great Britain, which began with the very first issue and still has some way to go before it is complete. Other series include my own introduction to clavichord tuning and maintenance (1995–2001), later to form the basis of a published book, and Paul Simmonds’ articles on playing the eighteenth-century clavichord (2003–4). In 2006 Lynne Mirrey began a series on pioneers of the English clavichord revival, which is ongoing. Nothing brings the Newsletter to life so vividly as a controversy. 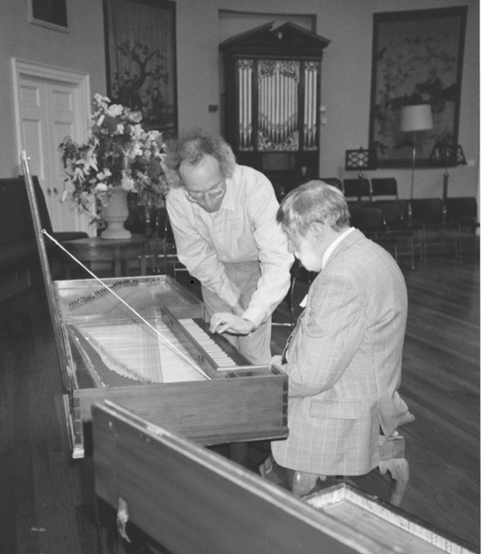 In 1996–7 there was a vigorous exchange between David Law, Paul Simmonds, John Barnes, Jeromy Rowett and myself, focusing on whether close copying of historic instruments was the only legitimate way forward for clavichord making. As a result, everyone must surely have reached a deeper understanding of the various issues involved, whatever position they eventually took on the matter. Another interesting Newsletter discussion took place in 2001–2002, in reaction to Maria Boxall’s suggestion (originally put forward in the Galpin Society Journal) that triple-fretted clavichords stood apart from the main line of clavichord development, were unsuitable for the proper realisation of much of the repertoire even of their own time, and had been too frequently copied by modern makers. This was contested by John Weston and Paula Woods: again, the result was to clarify for everyone the issues involved. In addition to the Newsletter, every member receives a personal free copy of the International Clavichord Directory, compiled by Judith Wardman and now in its third edition. This contains a great deal of useful information from various contributors, including guides to literature on the clavichord and to CDs, clavichords in museums and public collections throughout the world, technical drawings, kit suppliers, and lists of performers, makers, teachers, technicians, and other clavichord professionals. In due course, as more and more members acquire internet access, some of this information may be transferred to this web-site. Another service for members and the general public is the sale of books, music and CDs, especially those that are hard to obtain elsewhere. The Society also maintains a substantial archive, initiated by Jack Chatterley and continued by Francis Knights. This contains not only documents recording the history and achievements of the society itself, but also material relating to the clavichord in general, including books and recordings. Among the more unusual items are some tools and templates from the workshop of Thomas Goff. We are gradually building up a valuable reference resource which we hope in due course to make available to members and researchers: we have not yet, however, found a satisfactory permanent home for this material. For many years, the membership of the BCS has been stable at around 200. In its [first] fifteen years of existence, it had four chairmen (Peter Bavington, Edmund Handy, Garry Broughton and David Griffel) and four secretaries (Paul Simmonds, Jack Chatterley, Jonathan Ranger and Judith Wardman) but only two treasurers (Sheila Barnes and David Hitchin). [Since this was written, there have been two further secretaries: David Griffel, and the present incumbent, Karin Richter]. Many others, on and off the committee – far too many for me to be able to name them all – have worked hard to forward our stated aims, which are ‘to promote the understanding of the clavichord and the enjoyment of its music through the study of its past and present use, its construction and its repertoire’. How far have these efforts succeeded? Certainly we have informed and entertained our own members, most of whom seem to appreciate our activities; and we have introduced the clavichord to many members of the general public, including young people. We have not had much success, however, despite great efforts, in reintroducing the instrument into musical education. With honourable exceptions (particularly the Royal Academy of Music in London) conservatoires and music departments in the UK generally do not possess clavichords, and have no interest in acquiring them: or, if they are there, they are all too often unsatisfactory revival instruments, broken and unused. We have also failed, so far, to get much of a hearing for the instrument in the broadcast media. And we have not had much success in organising exhibitions of instruments, partly because of the difficulty of finding suitable venues, and partly because there are not many professional clavichord makers inside the country, and makers from continental Europe wishing to exhibit here face the expense and difficulty of crossing the English Channel. Nonetheless, a small exhibition was mounted at Finchcocks in 2008, which is something we hope to be able to repeat.